Welcome to my weekly series, Designing from Bones, where we use archaeology, mythology and the artifacts of human history to find and design stories. Join me today as we hunt for a deadly beast, a magical legend and a powerful motif. Come, my friends, the misty portal awaits us. I warn you well to heed no howling nor turn at the sound of padded feet following your step. Keep your eyes to the road ahead and pray we find no trouble on our journey today. To the northeast of London lie four counties that form the bulging eastern heart of England, East Anglia. Since the late 1100’s the pastoral coastlines, villages, fields and byways of this historically impressive region have been haunted by appearances of a demon dog that roams the night. 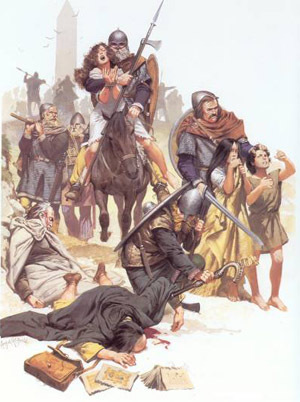 Emerging from the myths of a time when Vikings settled this place, Black Shuck, the mystic companion of Odin, has called East Anglia home, to the comfort of few and the fear of many. Accounts of Black Shuck speak of a hound ranging in size from that of a calf to a full-grown horse. Its ethereal howl echoes in the soul, a harbinger of impending death to those that encounter it. With large red eyes, sometimes green, sometimes cyclopean, sometimes with no head at all, the beast stalks those walking the straight roads between graveyards at night. Roads aligned with magical ley lines. Pulsing with ancient power. Traveled by the dead. From graveyard. To graveyard. Take a breath friend. Tonight the air is still and quiet. We are safe. Let’s look at three ways in which the legend of the Black Shuck speaks to us as writers about the power of myth. 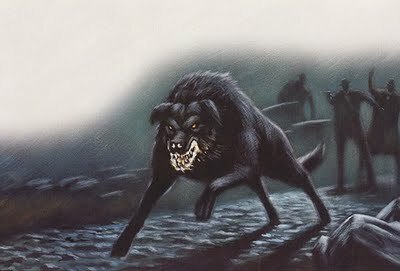 The Black Shuck was originally referred to as “scucca”, which means demon. Based on the myths of the feared and oft hated Vikings this hellhound served to reinforce the need of those that came after the famous raiders to exercise caution, especially at night and when alone. This dog of doom was birthed solely to demonize an old enemy and ensure that the common citizen would be thoughtful and prepared to let the authorities know if they saw something unusual lurking in the woods. Throughout human history and into the current day it is common practice to demonize an enemy, be it personal (I can’t stand her), national (as in times of war) or to inspire a populace to act aggressively against a weaker group out of hatred (the basis of many genocides). When considering your story, think of the setting and the history of the people and cultures that are set within this frame. Was there war at one time? Does a weaker group have more then a stronger one? Bad blood between a person in power and one that is not? Or reversed? Is it possible that the hero is caught up in legendary propaganda? In subtext? In action? Demons haunt our dreams because they play on our fears. Play on your characters fears and that of the culture he/she belongs to and see what myths howl in the recesses of their minds. Urban dwellers often forget about the mostly rural roots of humanity. 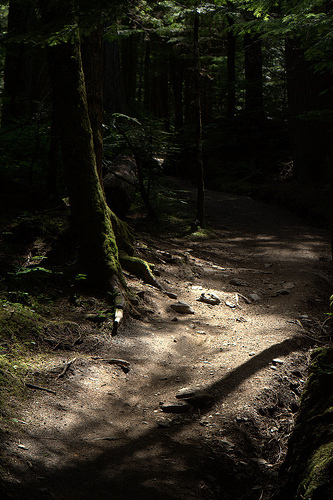 Of how a familiar path by day becomes a sinister and foreboding presence when traveled at night. Of how the shadows move and play as teasing spirits of our nightmares. Alone and with danger lurking in every owl’s hoot, we all would wish for a protector at such times. Few myths have only one facet and Old Shuck is no exception. Some tales speak of this mighty hound appearing from the darkness to accompany lone women through dangerous places or to lead lost travelers to safer paths or home. When considering the paths that our heroes will walk, what fears will play on their minds? Are they comfortable alone in the dark? Do they show strength in the face of the unfamiliar and uncertain? What protector would they wish for to accompany them through forbidding places and events? Delving into the emotions of our heroes is a way to find their depth and knowing how they will respond will help us to show the reader as well. Toss a bone to the shadows and see what emerges to return it. Are the dark marks from the claw of a fiery dog or the touch of lightning? You decide. One legend concerning Black Shuck stands out above all others. On August 4, 1577, Black Shuck crashed through the doors of the church at Blythburgh, Suffolk, raced up the center aisle past a crowd of praying penitents and killed a man and boy kneeling before the altar. This act was swift. Heads snapped back. Dead. As they fell the churches steeple toppled and crashed through the roof. Black Shuck fled the church, trailing fire in his wake and leaving a burn mark on the church doors that yet remains today. After fleeing Blythburgh, Black Shuck struck at the nearby village of Bungay killing a few more villagers in the church there. As it raced away into the night lightning struck the churches belfry shattering its clock and killing the two men within. Both of these events share one thing in common other than Black Shuck and death – a vicious lightning storm raged over the region that night. Imagine the Reverend Abraham Fleming of the Blythburgh church trying to explain to his congregation that two devoted followers were struck dead at the altar by a burst of lightning through the church doors. Killed in prayer by what is generally described as an act of God. While it is certain that something happened at these churches that night, Black Shuck is not the likely cause. However, his myth allowed Reverend Fleming and his counterpart in Bungay to redirect the shock, anger and fear of their congregations away from their God and onto a despised myth. Consider the myths that your heroes, antagonists or other players might use to cover their actions, movements or agendas. Perhaps a story their mother told them after the mysterious death of a loved one or during the height of a frightening storm. A story based on the emotions of the audience guides perception. Doubt takes root. Fear engages. Hear the howl? I now return you through the misty portal to your own time and place, for I feel the breath of Black Shuck on my neck and I’ll not find death in his hellish eyes. If you would like to see an example of how the legend of Black Shuck was used in story, Sir Arthur Conan Doyle’s “Hound of the Baskervilles” was based on this creature. Were you told any scary tales as a child that seemed real? Tell any to your own children? Does your story world hold any myths or legends that can be used to delve into the emotions of your characters? Sense anything unusual when you walk alone through the shadows? If you’re interested in more great information and ideas on writing, check out my previous Designing from Bones entries found in “Categories” on the side bar. This entry was posted in Designing from Bones and tagged black dog, Black Shuck, Blythburgh, Bungay, cyclops dog, demon dog, demonize, designing from bones, devil dog, East Anglia, Gene Lempp, history, Hound of the Baskervilles, legend, myth, Odin, Reverend Abraham Fleming, scucca, shadows, Sir Arthur Conan Doyle, Vikings, writing prompts, writing tips. Bookmark the permalink. Awesome writing, Gene. This is a page-turning thriller! I hope that dog stays on the page and doesn’t go wandering! I didn’t remember what it was called, but I’m a big fan of Hound of the Baskervilles (and also taught it in college lit classes), so I’m familiar with Doyle having used local legends of a demonic hound. Cool stuff, Gene! Really great post! 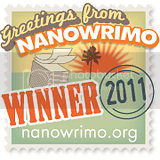 I especially connect to the demonizing your enemies bit– that’s a good bit of writing, SO interesting! Legends make great backgrounds for stories. Your research brought an obscure bit of history into the blogsphere, and will probably inspire several people. Thanks for sharing. Everytime I read one of these posts, I wonder: where does he find this stuff?! So fantastic! This story would be great around a campfire. Creepy! Awesome as usual. I love how easy it was for the priests to divert the blame from the lightning to the legend. How easily are we led? 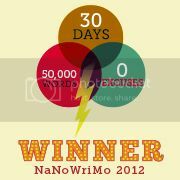 Oh so much wonderful fodder for the writer’s imagination. Great work, Gene. Great writing! Always wondered if the Hound of Baskerville was based on something else. Only ever saw it on TV though. Isn’t that something that Hound of the Baskervilles was based on Black Shuck? And the cyclops eye, wow, that sparks all kinds of ideas for my stories! I love the way you write and tie this all together and point out the various aspects that we can add in our writing. Excellent, as usual! I will always love these posts, Gene, and this one is no exception! I’m fascinated by the myths and legends that spring up from the attempts to explain something that either minds at the time couldn’t conceive or that others didn’t want others to conceive…and it always makes me wonder what we believe today turns out to be a similar myth. Your comment about the same path being completely different at night just reminds me of when I was younger and hated walking out to any of the barns in the evening because it was so terrifying, even though I can spend all day there during the day without an ounce of fear. I’ve got to love anything related to Vikings, too, and now the Darkness’ song Black Shuck has taken on a whole new level of appreciate for me; I never really paid much attention to it before, and it’s the first thing that hopped into my head with this post so I looked up the lyrics after reading this and…that’s just cool. I come from a family of storytellers, and they love nothing more than to frighten with their stories. When many of these old legends began, they were cautionary tales. The world must have been a much more dangerous place. I like that you talked about assigning guilt to the boogeyman. It’s an interesting thing we do. I’ve wondered if it is not an attempt to play on people’s fears and control them. My goodness, I wish I wrote paranormal. This is a really cool character with a very colorful mysterious history. Ellie: Demonization is one of those horrible things that people and societies do to manipulate opinion. Personally, I think that our world would be a far better one if this practice was given up. Renee: Oh yes, stories of this nature make great camping tales over roasted marshmallows and cocoa. Thanks for the twitter suggestion as well! August: Glad you enjoyed the post. The line you quoted is my favorite from the post by the way and you are right, this would make a great movie plot. I can picture the villagers combing the woods looking to bring their vengeance on the “foul spirit”. Lisa: Arthur Conan Doyle loved to use myth and legend in his stories, these are natural elements for mysteries of all types. Jane: Thank you, as well. Great article Gene.Your articles stir my creative side. I love this series, Gene. 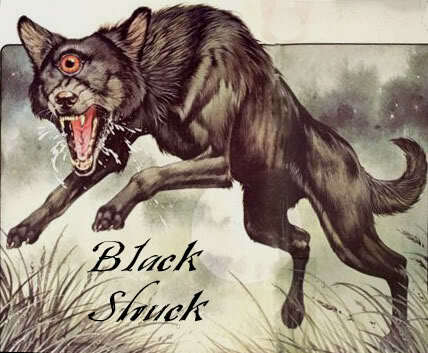 I had never heard of the Black Shuck, but I can see it as the basis for the Hound of the Baskervilles. Thank you for your work. I am an East Anglian and live not far from where you speak. (Do you like my ‘old’ way of speaking?). I had never heard of Black Shuck. The only dog like creature I have heard of is the ‘Beast of Bodmin’. 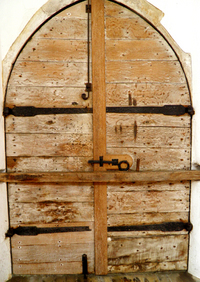 I am in the process of writing a short book about legends of big dogs and I’d love to include your picture of the Blythburgh door. Did you take the picture of the door half way down the page? If so would it be possible for me to use it? I would of course be happy to include a credit and link to your blog. Unfortunately, the picture of the Blythburgh door was an unattributed picture at the time I found it–not one from my personal collection. The only note attached to it says: “Olympus Digital Camera.” While I appreciate the offer and your interest, I cannot take credit. After a search, it appears the original source of the photo is no longer online.